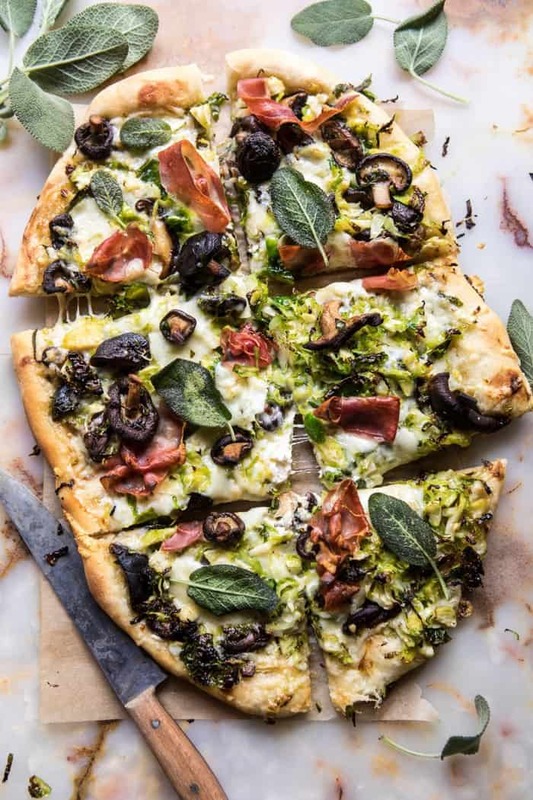 Tomorrow marks the official start of fall and this brussels sprout mushroom pizza with crispy prosciutto and sage is the perfect way to celebrate! This pizza! I know I say this about all the recipes I tell you guys about, but I love this pizza. It’s all things cheesy, veggie loaded, and delicious. I mean, really? 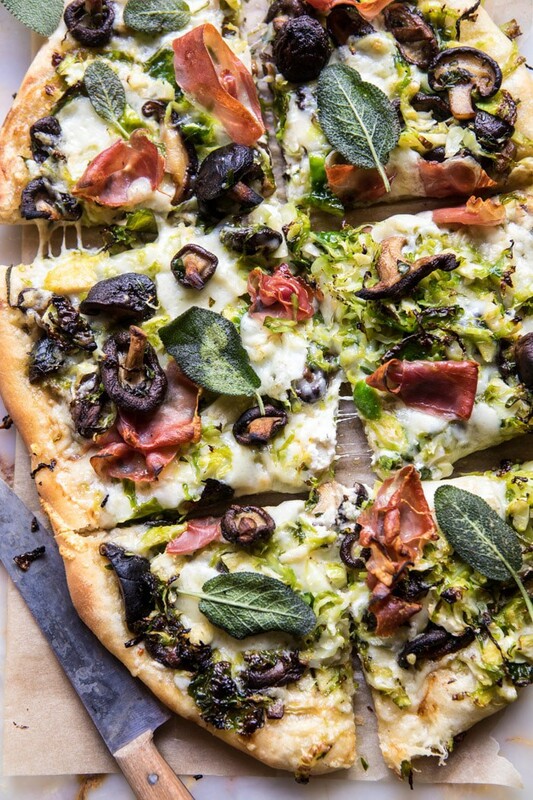 What could be better on top of a fall pizza than cheese, caramelized mushrooms, brussels sprouts, and crispy prosciutto. 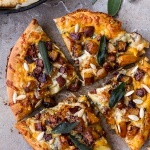 It’s the perfect autumn inspired pizza. Oh, and how about my long as ever recipe title?! As always, I just could not leave anything out. 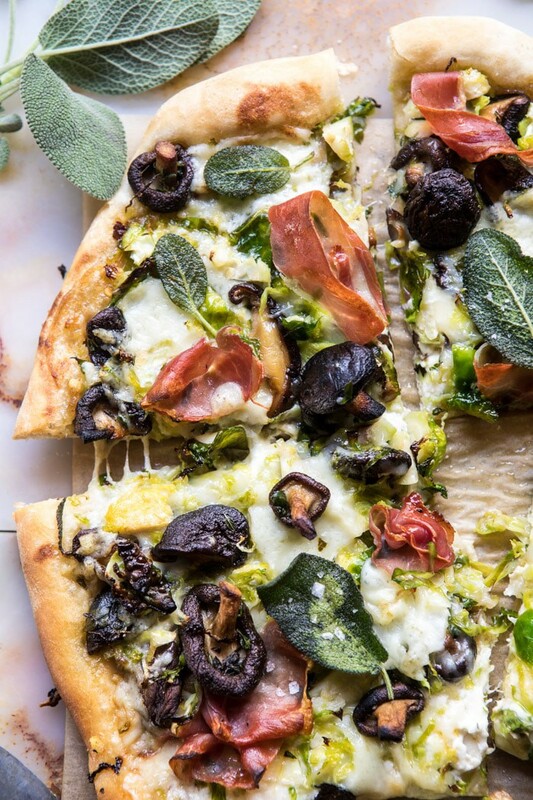 It seems that for just about every month of the year I like to create a new seasonal pizza recipe. I don’t know if it’s truly normal for people to make pizza every other week, or even once every week, but I honestly do. 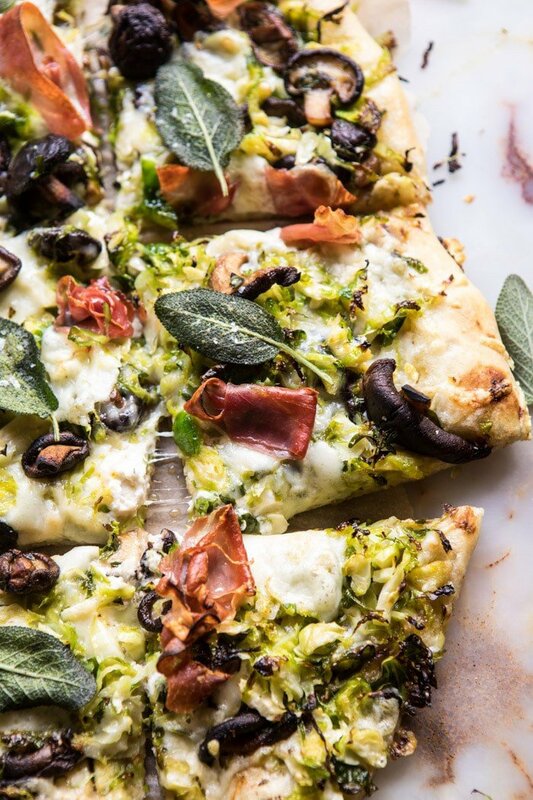 Pizza is just a meal that I can so easily customize to what I have on hand or what’s in season. It also helps that it’s warm and gooey, and loaded with cheese. DUH. So I guess what I’m trying to say here is that this is my September pizza. 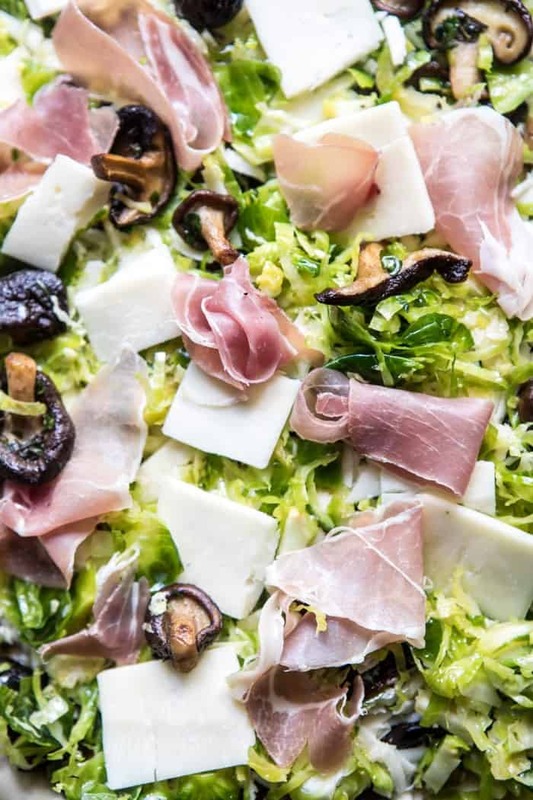 Loaded with in season brussels sprouts and mushrooms and even a hint of hidden apple flavors. It’s a combination of savory and salty, with just the slightest amount of sweetness that you don’t expect, but is surprisingly delicious. So what’s my secret to making this pizza so good? A light spread of apple butter. I know, I know, weird. I swear though, it is so good. Especially with all the salty cheese and prosciutto. 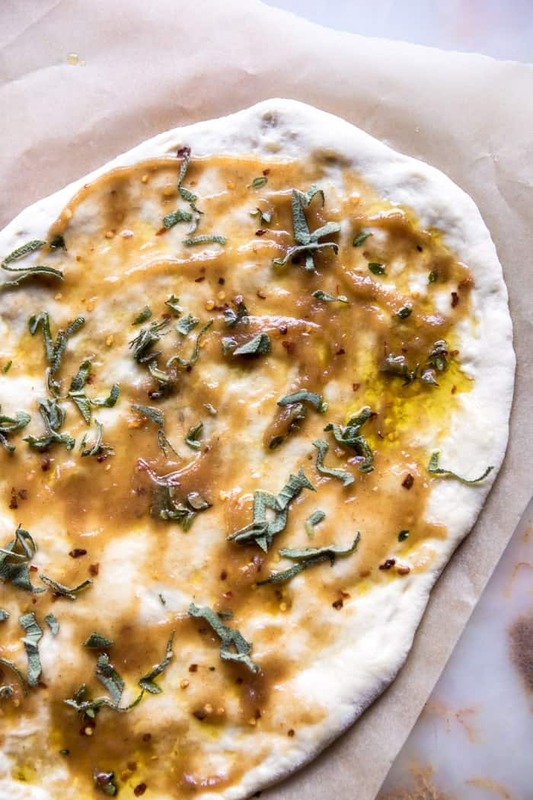 The apple butter adds the sweet element, and it’s what makes this pizza different from any other. I love the pairing with the autumn vegetables and hardy fried sage on top, it’s perfect, and such a great way to end your week… and kick off the start of fall tomorrow. Meaning Friday night pizza in for the win! Also, speaking of the official start of things…and celebrations, today is the kick off of the the HBH Retreat Weekend here in Colorado!! Ahh, I am so excited, but also so nervous. It’s going to be such a fun weekend. I’m headed down to Denver later today (with my mom in tow) to meet the group for drinks, dinner, and probably after dinner drinks as well. You know, because we have to kick off this retreat weekend properly! The festivities will continue on Friday with breakfast in Denver and then the drive up to my little town for hiking, relaxing and dinner at the Breckenridge Distillery. Saturday will consist of horseback riding, some exploring in town and a happy hour hike with award-winning nature photographer, John Fielder. Then we’ll conclude the day with dinner here at the barn, complete with a Colorado craft beer and wine pairing. Everything will get wrapped up on Sunday with a fun brunch here at the barn! Fingers crossed the weather holds up. It’s supposed to rain all weekend, but I’m trying to think positive thoughts!! 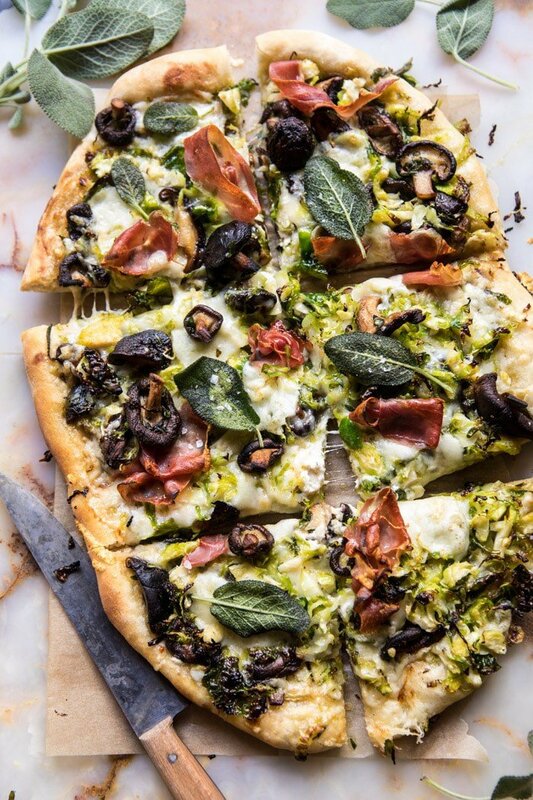 Tomorrow marks the official start of fall and I think we should celebrate with this brussels sprout mushroom pizza with crispy prosciutto and sage. 2. Heat 2 tablespoon olive oil in a large skillet over high heat. When the oil shimmers, add the sage, fry 30 seconds. Remove from the skillet and set aside for serving. To the same skillet, add the mushrooms and season with salt and pepper. Cook undisturbed for 5 minutes or until golden, stir and continue cooking until the mushrooms have caramelized, 3-5 minutes. Reduce the heat to medium. Add the butter, garlic, and herbs. Cook, stirring occasionally until the garlic is caramelized and fragrant, about 5 minutes. Remove from the heat. 3. 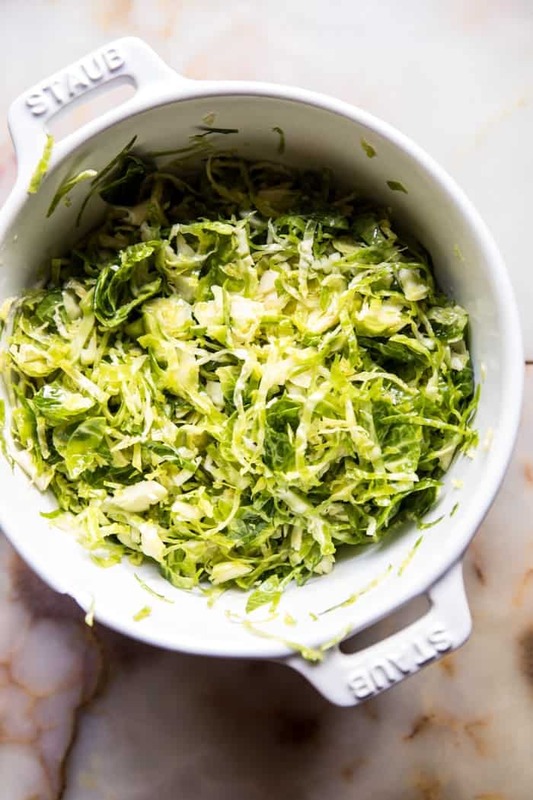 In a medium bowl, toss together the shredded brussels sprouts, the remaining 1 tablespoon olive oil, and a pinch each of salt and pepper. 4. On a lightly floured surface, push/roll the dough out until it is pretty thin (about a 10-12 inch circle). Transfer the dough to the baking sheet. Spread the apple butter over the dough. Break the ball of burrata over the dough and then arrange the mushrooms and brussels sprouts over top. Sprinkle on the provolone and the top with prosciutto. 4. Transfer to the oven and bake for 10-15 minutes or until the crust is golden and the cheese has melted. Top with fried sage. EAT! Have a great Thursday! 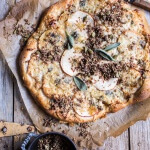 Tomorrow pizza…and the perfect Autumn breakfast! 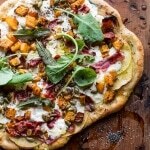 Roasted Butternut Squash Apple Burrata Pizza. Oh yes, this hits all the spots. I mean all the spots, really!! Yay! So glad you loved it Ruth! Yes it is so good with the prosciutto and sage! I hope you love this Kelsey! Thank you!! 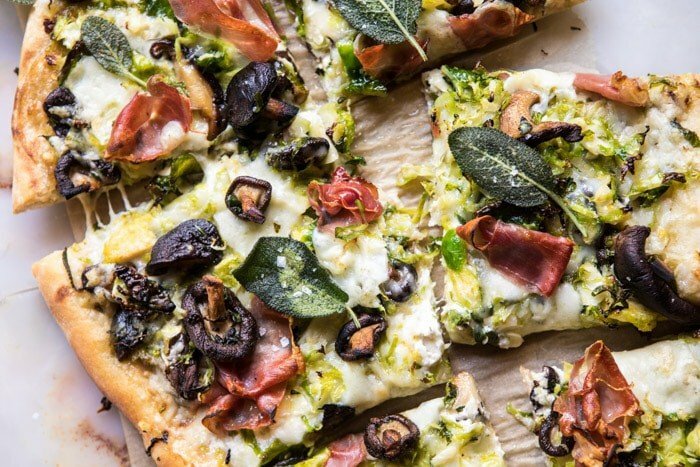 Love all your pizza recipes! Waiting patiently for your apple butter recipe, too! Have a great time with all your lucky guests at the retreat-so many fun things planned. Hope you will do a full post here with lots of photos! Thank you so much Jean! I am sure we are going to have fun. Can’t wait to share the photos! How do you make the apple butter? Oh my gosh…this looks FABULOUS! I will be making this with gluten free crust FOR SURE! Sounds amazing! I hope you love it Chelsea! This looks so yummy! So jeally that I’m not with everybody at the retreat; it sounds like so much fun. I’ll have to live vicariously through Instagram! Cheers! Haha thank you Penny! Totally wish all of you could come on the retreat! This looks absolutely perfect! 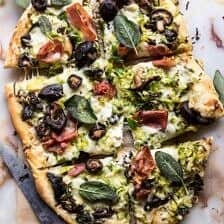 Our family has pizza night every Friday night so pizza recipes are always welcome! Also wanted to mention that I’ve tried four of your recipes from the cookbook so far- blueberry muffins, Mediterranean lentils/ roasted honey carrots, spring pea and mint risotto and oatmeal chocolate chip cookies and everything was delicious!!!! I’m drinking your pumpkin spice latte recipe now and we’re making the sweet potato skins with turkey for dinner. I’m buying more cookbooks for my whole family for Christmas. I think I need more meals in the day just to fit in all the recipes. Keep up the good work and have fun this weekend! This recipe looks wonderful! I love Brussels sprouts! Fingers crossed that you have an excellent weekend and that the weather holds up! The post is amazing. I’d like to make this one for our middle eastern restaurant melbourne. Thanks for sharing. Haha I’m glad! Thank you! Thank you Sophie, I am so glad you enjoyed it! Haha!! No offense taking! I think adding cherry tomatoes would be delicious! 🙂 They will burst in the oven and taste awesome. Love the idea! Enjoy the pizza! Couldn’t find apple butter at my local grocery store, but I couldn’t wait until the farmer’s market tomorrow to grab a jar because I wanted to make this so bad!! So I used some caramelized onion and maple confit and it turned out absolutely delicious 🙂 Thanks so much for this recipe, another hit!!! Awh so glad to hear that Caroline! Thank you! This was probably my favorite pizza recipe that you’ve posted so far. The mushrooms and brussels sprout combo was to die for. I made your butternut squash pizza from the bonus recipe packet last night and it was amazing too! Loving the fall flavors. Thank you! I am so happy you enjoyed this and the butternut squash recipe! Thank you Libby!